Why it’s cool: Because there is live music almost every night ranging from rock to jazz to all kinds of genres. Lámpás is a little underground labyrinth right behind the grand Synagogue. the entrance is easy to miss, so watch out for it, because this place truly delivers! 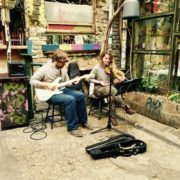 There is live music almost every night and Lámpás also hosts open mic nights and other cool events that are different from the regular “let’s-just-get-a-beer-pub-experience”. Check out their event calendar here. The place itself is located in a winding cellar which makes for an extra special atmosphere. 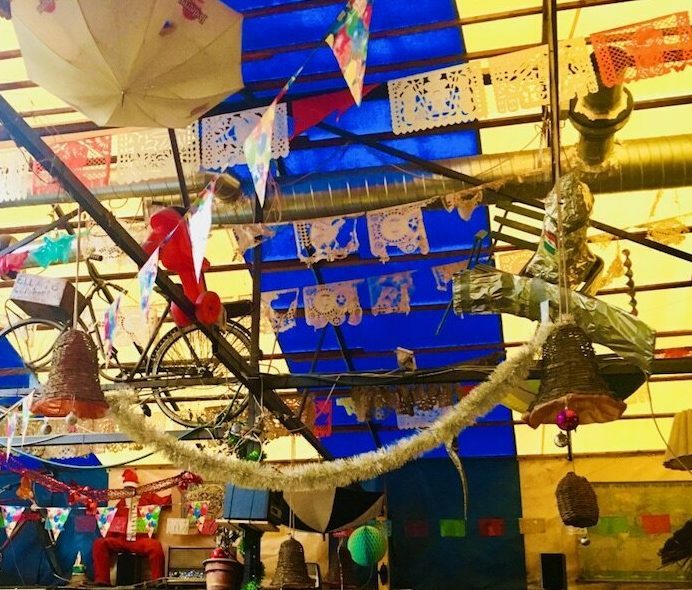 A perfect bohemian addition to Budapest’s party district! Why it’s cool: Because it’s the perfect hangout at any time of the day and the night. Kisüzem is a bit like a friendly living room. In the afternoons it serves as a café including everything necessary: good food, natural light and fast wifi. As the day progresses, it gradually transforms into one of the coolest local bar-hangouts of district VII, serving affordable drinks to a relaxed crowd. Kisüzem is a place to have the best conversations: during day and night, deep and superficial, sober or under a slight alcoholic influence. We’re just too happy it exists! Why it’s cool: Because of its awesome craft beers, delicious tapas and friendly atmosphere. Fekete Kutya (“The Black Dog”) opened in 2013, right when the district was booming and one cutting-edge, thoroughly designed place opened after the next. As opposed to all of these, Fekete Kutya did one thing right (at least for us): It never wanted to be anything “big” and groundbreaking. Just a cool and authentic bar with good drinks, good food and good people. The interior is simple but tasteful and the bartenders are friendly. 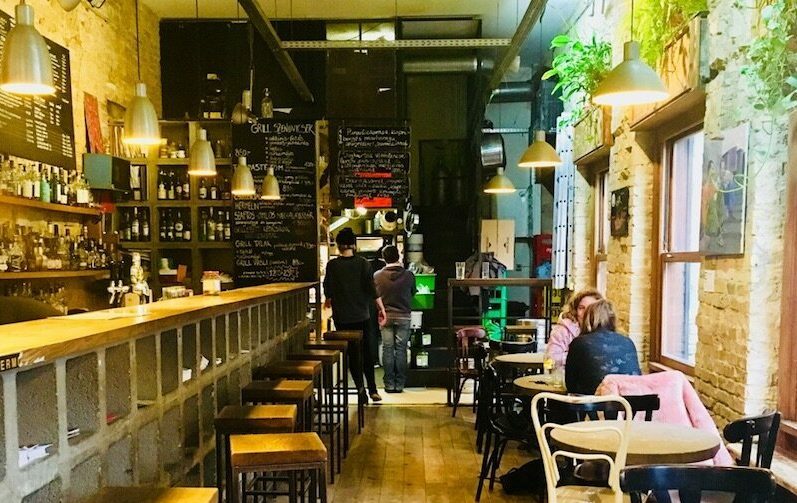 This is the place to go if you want to try the best of Hungarian (and also foreign) craft beers, snack some delicious Hungarian tapas or kick back a pálinka (or two). Among all the pub-crawl stops and shiny new “ruin pubs” Fekete Kutya is authenticity at its best. Why it’s cool: Because the inner courtyard is heaven during summer. Although the “Stone-Soup Garden” is definitely no hidden gem anymore, it’s still a place we wouldn’t change for anything in the world. Especially during summer. Their huge terrace is a big oasis full of trees and the colourful wooden chairs and tables just want you to stay for hours and hours. Although the place is often packed, especially during weekends, you’ll always find a place to sit as there’s somehow always enough space for everyone. 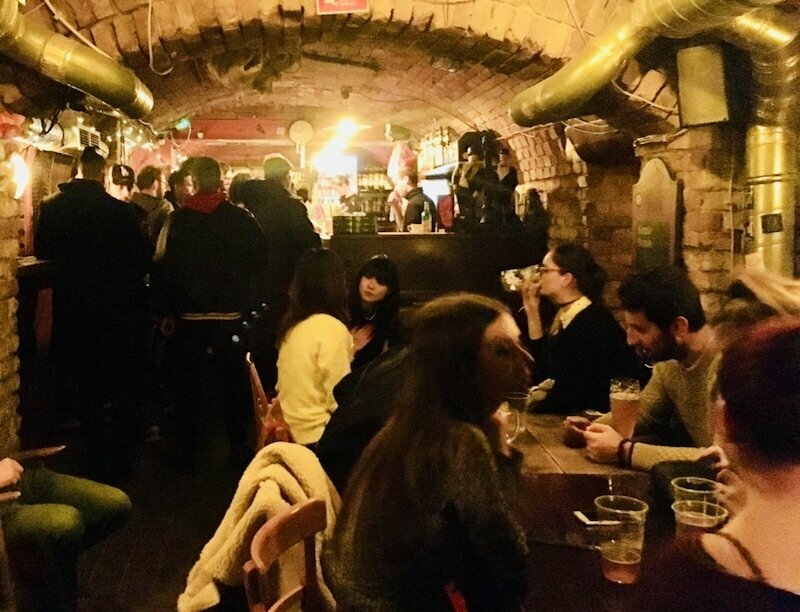 Kőleves Kert is also perfect for a bigger group of people and kind of the place to bring your friends from abroad to show them the cool Budapest vibes everyone is talking about. The bar & restaurant inside keeps operating in winter and the red pots inside make for a super-homely vibe. Why it’s cool: Because it’s literally a living room topped with awesome rums and whiskeys for the evenings. Nappali literally translates to living room and that’s exactly what you’ll find once you enter this cozy little café & bar. 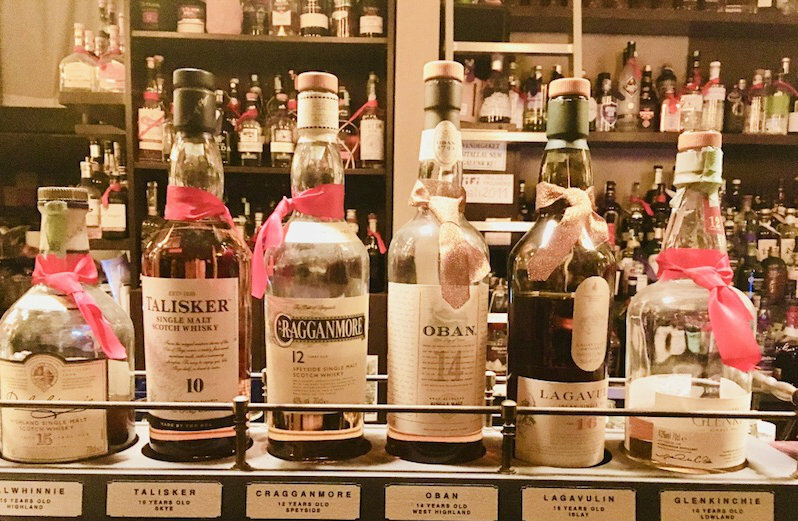 This place is located right at the edge of the buzzing Kazinczy Street but you’ll still feel like in a homely home here that is packed with whiskeys, rums and old furniture. Nappali is an established meeting and talking point of lots of old and new Budapestians and many of them make their way to the party district only to come here. You can easily spend your whole afternoon and evening at Nappali by starting with a hot coffee and finishing with beer or a specialty rum and whisky – with your friends or alone. Everybody is simply welcome here and the old CRT monitor in the corner is an extra bonus for every retro-lover (us!). … and a bunch of quality booze. What’s not to like @ Nappali?! Why it’s cool: Because it has the best burgers in town, paired with a wide array of awesome craft beers. 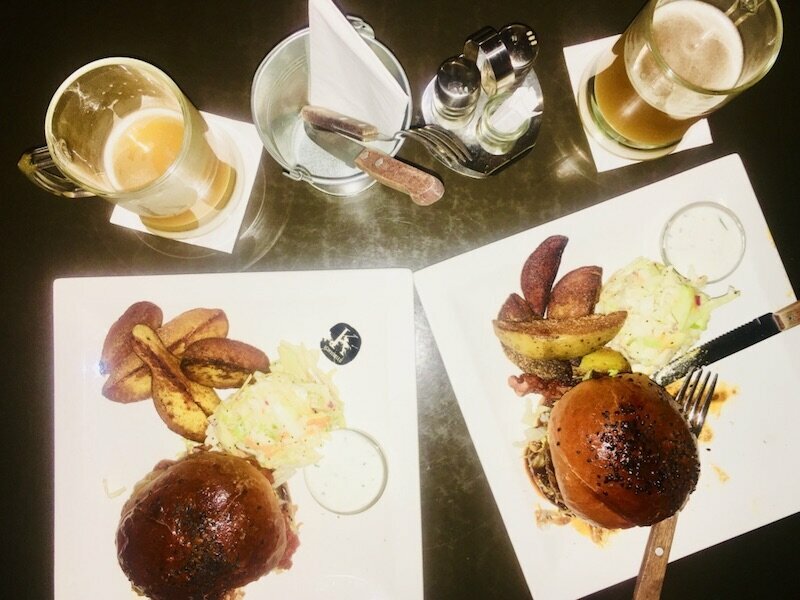 Nothing like a good burger and craft beer – Kandalló totally nails them both. In our opinion this is the place to go for the best burgers in town (seriously!) and have a great evening in a cozy pub. The staff is super friendly and very willing to give recommendations. Various craft beers flow from 16 different taps, so if nothing matches your taste here, you probably don’t like beer. Kertész utca is, in our opinion, the more relaxed counterpart of the overhyped Kazinczy Street and Kandalló is a prime example for that. Why it’s cool: Because it’s one of the few very affordable and unpretentious ruin pubs. Füge udvar is one of those ruin pubs that didn’t overdo the design-part of the game. It’s a simple inner courtyard of a nice old building with very affordable prices and a laid-back crowd. There is table top soccer and it’s one of the few indoor terraces of the city. If you want to experience a ruin pub without all the buzz and fuzz, this is your go-to place! 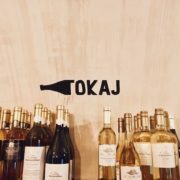 Why it’s cool: Because it’s an awesome casual wine bar with lots of Hungarian (wine)s.
Kadarka is actually a popular grape variety in Hungary and that’s also what this place is all about. 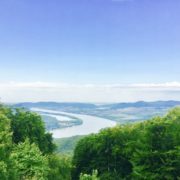 This place remained, despite of its super-central location right on Király Street – a very local gem and features the best wines from all across Hungary and beyond. The place is packed on weekends and for good reason. They usually will find you a spot however, but if you’re more than two people it does make sense to call beforehand and make a reservation. The prices are very fair and include good staff-recommendations, snacks and a frisky atmosphere. Of course you can also take a bottled drink home if you liked one particularly. Kadarka is a great way to start any evening! 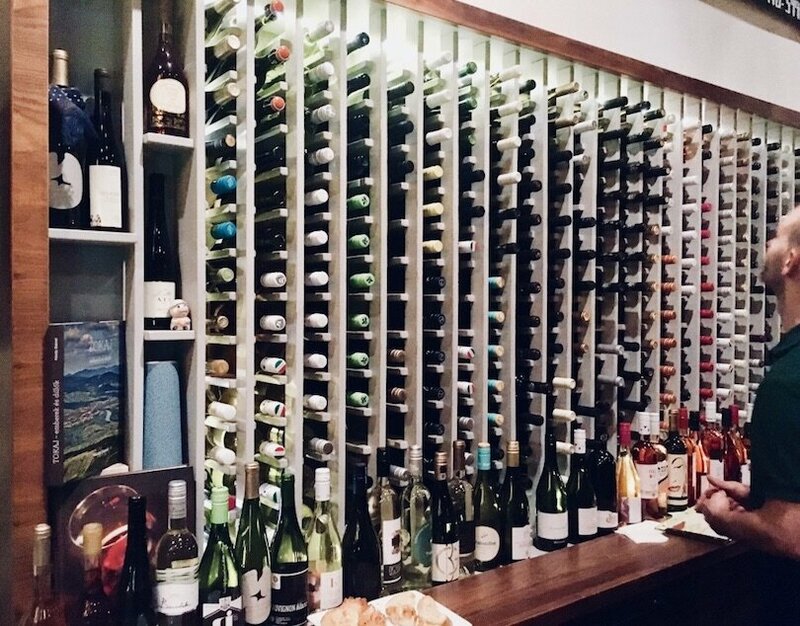 Tip: If you’re into more wine, click here for our 16 favourite casual wine bars in Budapest! Why it’s cool: Because it’s a fun and chill place to dance the night away. 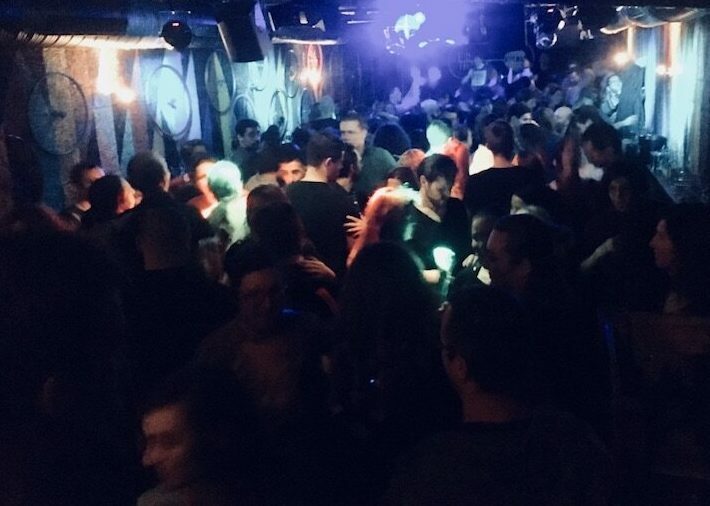 If we decide to go out and party in district VII, we do it at the basement of Mika Tivadar. Why? Because it’s definitely the most casual and laid-back place to have a great night out! The really cool thing is that they constantly have differently themed nights. Think Balkan parties, open mic, electro swing or even the carnival of superheroes. The crowd is a good mix of local and international people, the music doesn’t stop til the early morning on weekends and if you need a break, you can simply head up to the ground floor, sit at one of the tables and give conversation a chance. The latter is also perfectly suitable for a conventional afterwork drink at any day of the week. Why it’s cool: Because of its colourful door! And the laid-back vibe that awaits you inside. 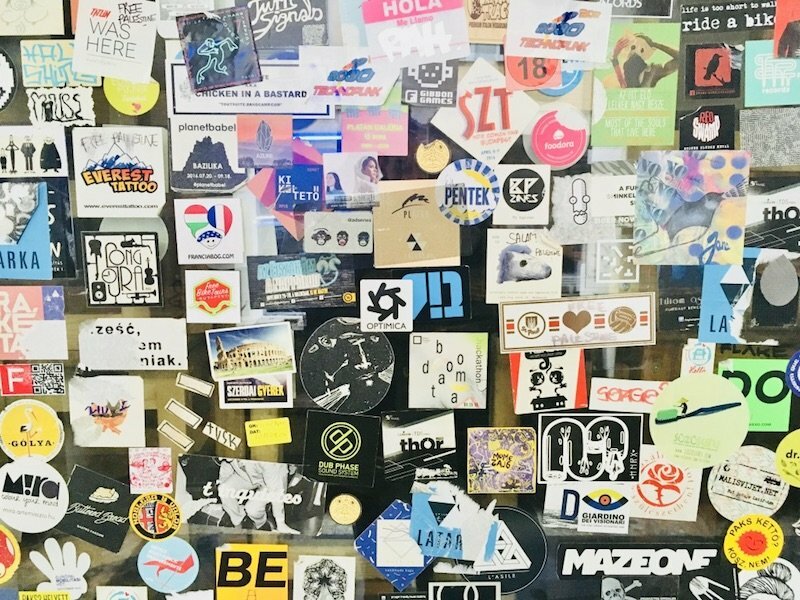 Telep is admittedly a hipster’s paradise, but definitely a good one! It’s both a bar and a gallery with the clear mission to provide an exhibition space for young and thriving artists. What will await you here is a relaxed atmosphere, a place to have conversations, a shitton of colourful stickers, a friendly crew and good beer. 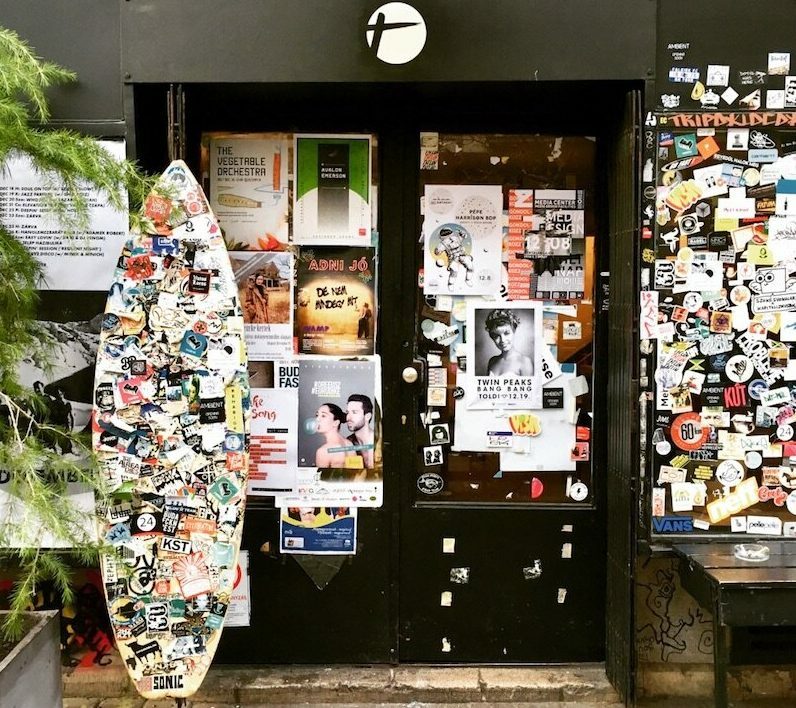 Plus we absolutely love the colourful entrance door and its surfboard! Why it’s cool: Because it managed to resist time in every aspect. Time, prices and interior stood still at Előre 57, a little pub close to Nagykörút. 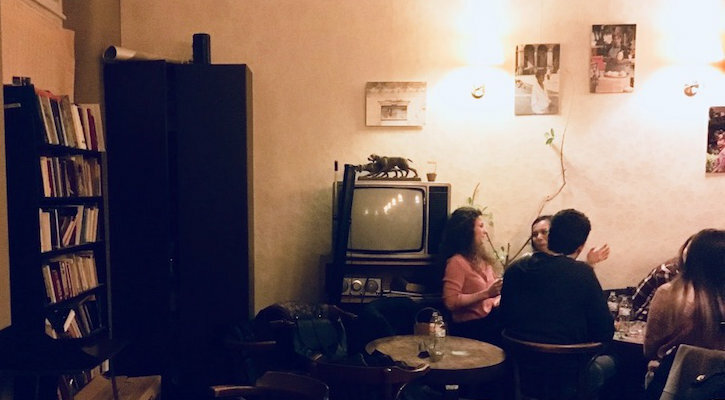 Seriously, if you miss the times when a big beer cost below 500HUF and a kocsma was nothing more than a kocsma – a simple, easy-going place to hang out and have a drink, you absolutely have to come here. Előre 57 managed to survive in Budapest’s party district even though (or exactly because?) it resisted time in every aspect and stayed true to its original mission: To be a super-affordable neighbourhood-pub where everybody’s welcome. Nothing more and nothing less. Why it’s cool: Because its pleasant year-round terrace never ceased to be pleasant. Ellátó kert grew on us a long time ago and it’s still a place we absolutely love to go to for a drink. Their Mexican kitchen is delicious and is a perfect company for any beer. The terrace is open year-round and is simply enchanting at any time, regardless of the season. Somehow, Ellátó Kert managed to attract and keep a very loyal, local and easy-going crowd without becoming a pretentious place over the years. Why it’s cool: Because it’s a great spot for seeing all kinds of old and new Hungarian bands live. 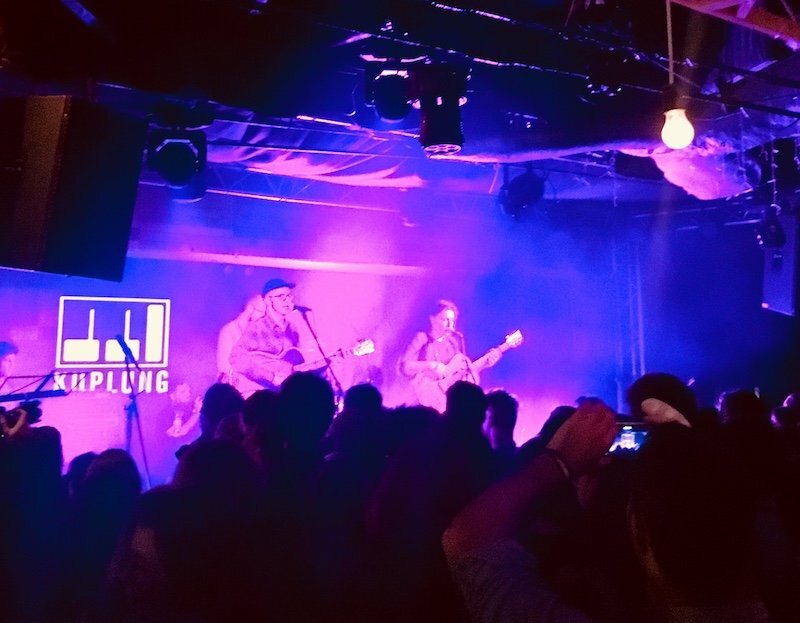 If you’re into quality live music, look no further than Kuplung right on Király Street! 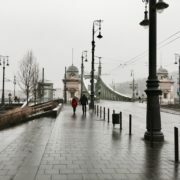 This is the place to go for concerts almost every night and also the best spot to listen to Hungarian bands – old and new! Be it contemporary indie or an old classic rock band, Kuplung is a great place to hunt down the country’s best musicians. Besides concerts, they also host various theme-parties, be it Balkan disco or a Retro party. 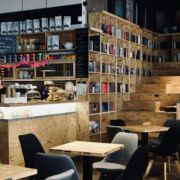 Kuplung makes sure you’ll never get bored in Budapest, so check out their events here and get to know this cool place one night soon! 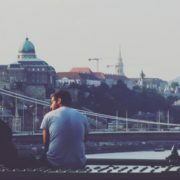 Tip: If you want to dive deeper into the Hungarian music scene, check out our ultimate guide to Hungarian bands and musicians over the decades! Why it’s cool: Because it’s a true allrounder mixing good conversations with dancing and table soccer. Tucked away in what looks like a garage, Beat on the Brat is a great little allrounder where you can drink, dance, talk and tablesoccer the night away. It’s a good place to meet people (table football always lends itself for that!) but also to shake a bit under casual circumstances and without having to dress up in any way. The music is super-diverse and mostly non-commercial; you’ll hear everything from rock’n’roll over punk all the way to contemporary beats. 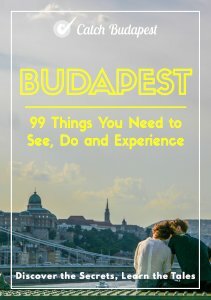 One of our favourites when it comes to the Budapets-nightlife – unpretentious, unconventional and casual – just as we like it. As you can see, not all is lost in the Budapest party district. In fact, there are many great places that still draw a local and laid-back crowd and make for an awesome night out in the city. The trick is to separate the wheat from the chaff and find the cool spots in this urban jungle of bars, ruin pubs, pub crawls and overpriced but unauthentic tourist traps. We really hope you like the places we recommend; please let us know if we missed your local favourite in the comments below! 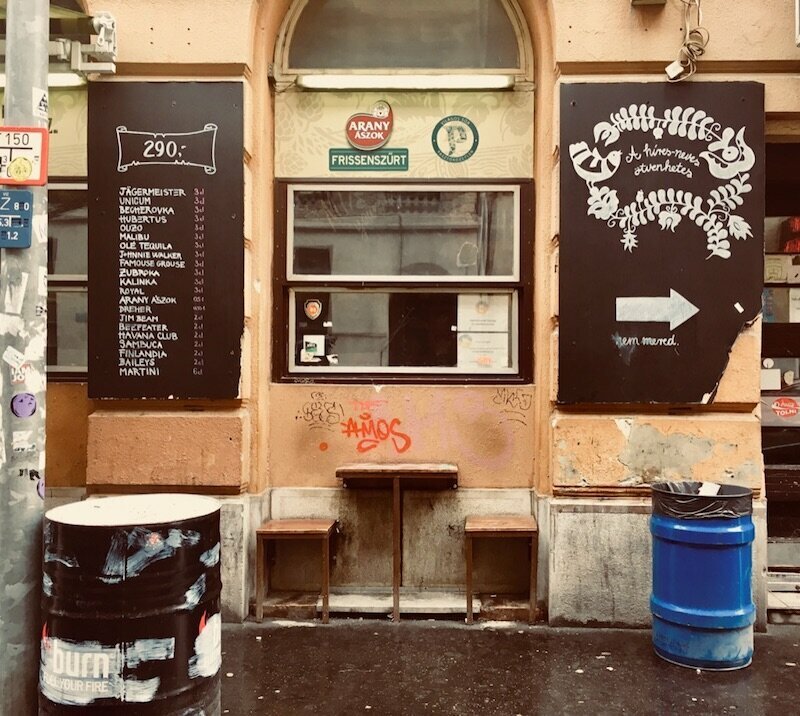 Budapest’s Ruin Pub Culture – A Ruined Pub Culture?